The salt wagon has moved on since earlier this afternoon. It now looks like this. I have some P.O. lettering transfers (white, shaded red) which I think will look quite smart - if they go on OK. There's only enough for one go at it, so fingers crossed. While waiting for the paint on the wagon to dry, I managed to work out more or less what the front end of a cart's axle swivel looks like, so that little project has moved on as well. The horse and those cart bits date back to about 1970, I reckon, so well due to be used. 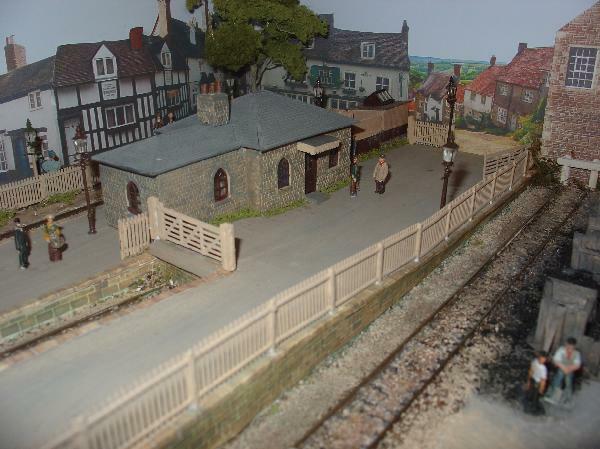 And finally, a look at the station yard with a conversation in progress. A lot of bonus jobs got done today - Kadees replacing tension locks on the last loco to be built. It had stopped working and the fault was traced to a failed soldered connection on one of the motor leads, soon sorted. I found a couple of figures to go on the footplate, and they both needed a bit of work; the driver used to be a seated figure, but is now standing thanks to a pair of leg transplants. His mate (who used to be an overalled RAF type) now has a baggy cap and the suggestion of a jacket, worm over his overalls. The cart has had a second coat of paint and the bay horse is turning into a chestnut. I even got the main name onto one side of the salt wagon. It is to be lettered WINSFORD - a Cheshire salt mine operating in the 1860s, that later became part of the Salt Union. Finally a start has been made on the operating cards with the public's explanation of the train movements on the backs. 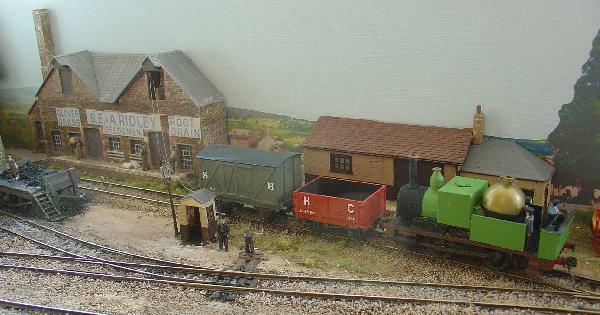 I'll try and get some more pictures tomorrow or Thursday, before packing the layout up to travel. 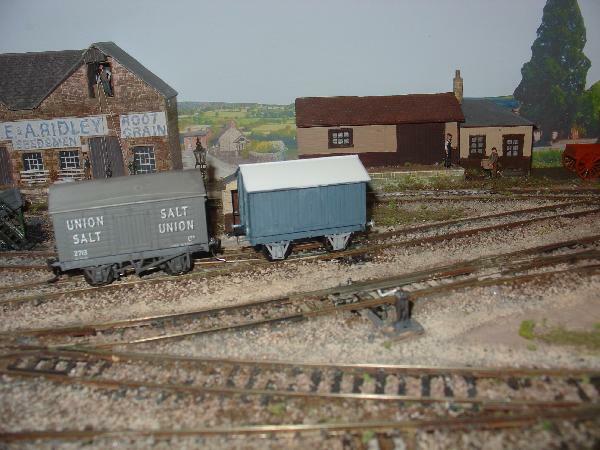 starting with the salt wagon, seen here with paint drying on the lettering; the transfers were very old and quite a few broke up on application and needed coaxing into place in two or three pieces. I must number the locomotives; as this is the newest (it has a half-cab - very modern!) it will probably be no. 6. Seen here bringing a train into Salop Street. The newly employed fireman is keeping a close look-out. It's a misty early morning as the first train makes ready to leave Salop Street. Judging by the cattle truck next to the engine, it must be Wednesday, and those cattle are expected in Ludlow market later in the morning. 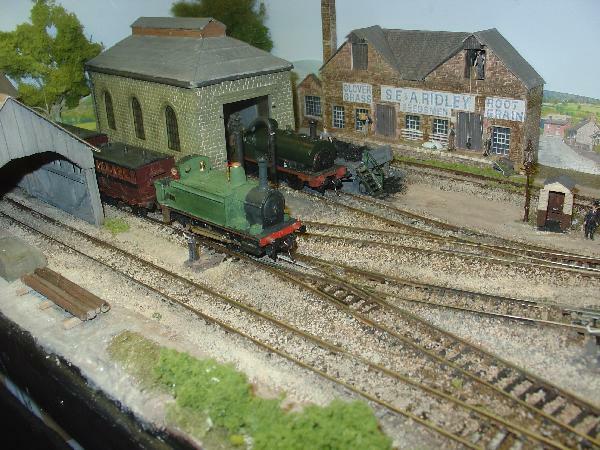 I only managed to take five pictures of the layout yesterday, and two of those turn out to duplicate some taken earlier - so here are the others. I am hopeful that I will be sent some photos taken by visitors at the show, which I will post later if permission for their use is given. No 6 is doing some carriage shunting. The little 2nd class/luggage vehicle has been fairly camera-shy up to now. It was made from some left-over scraps of a Slater's four-wheeled coach. 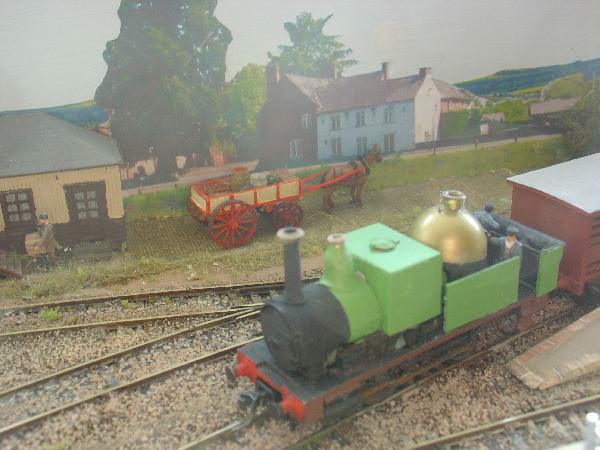 The long saddle-tank loco waits to depart for Ludlow. The drover-brake/3rd is in the loading dock along with the van delivering the daily ice for the town's traders. 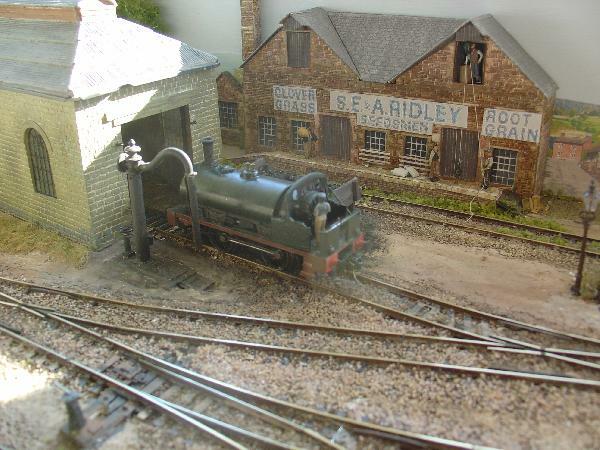 No 6 arrives at the head of a passenger train; the saddle tank rests between duties by the shed. These two locos proved to be the best runners during the day, and No 6 improved noticeably as the gearing bedded in. The other two suffered from couplers set a little too high. A programme of alteration to the front coupling mounts on all the engines looks inevitable. 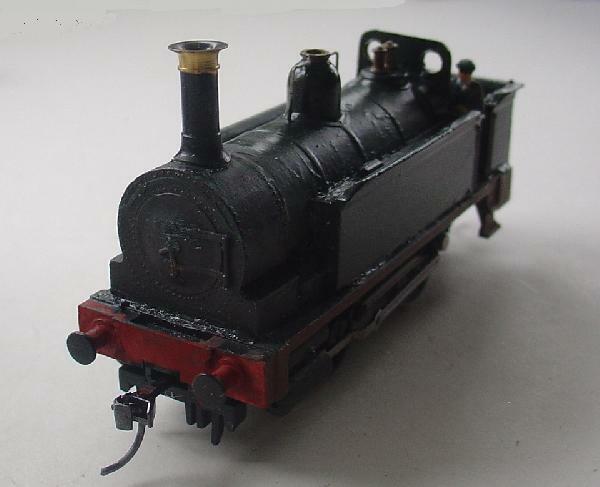 Had a go at changing the front coupling on "Jumbo" - went well, using an overset coupler so I didn't need to cut away all the supporting plastic. The lower setting of the coupler box meant I could blank in the centre of the buffer beam with a rectangle of thin styrene, fitting between the cast buffers. It looks much better now. 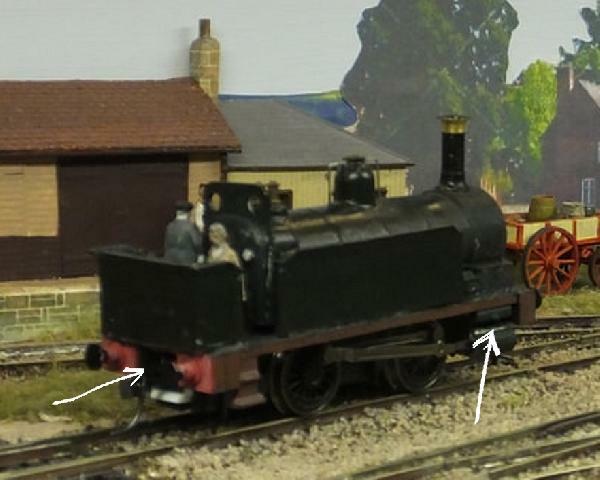 The other problem with the loco was that the body was a very tight (almost too tight) fit round the motor, which made it difficult to sit the body level. It turned out the pinch point was the saddle which used to hold the motor - now re-mounted - and to which the spring fitted to hold the motor in mesh in its original setting. Even better, it was plastic and not the metal I'd expected and so was easily trimmed away. The body now goes onto the chassis much more easily. I thought I'd posted a picture of my home-made figures, but found I hadn't - so here they are. The men have been de-mobbed from railway service, with a change of headgear, as I'd run out of "gentlemen" and their uniform frock-coats look quite all right for civilians. The rest of the outstanding jobs on Salop Street can wait a while, as the layout is not due out again until October (at the Croydon show). With Puerto Paseo due at Crawley next month I've been altering the baseboard supports so that all three current layouts can use them. There are also some couplings to fettle over the Easter break, so nothing very much to photograph for the next few weeks. A very good day at the Crawley show; photos will be posted elsewhere in this forum after the week-end. Meanwhile, Salop Street may have gained a new and unexpected locomotive. 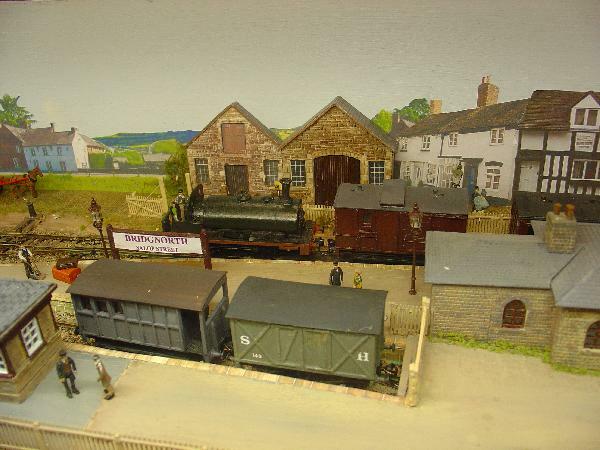 Kernow Model Railways were at the show and had a few of their Beattie Well Tanks on special offer. I've always wanted one, and the offer proved irresistible. So, what will it be used for? 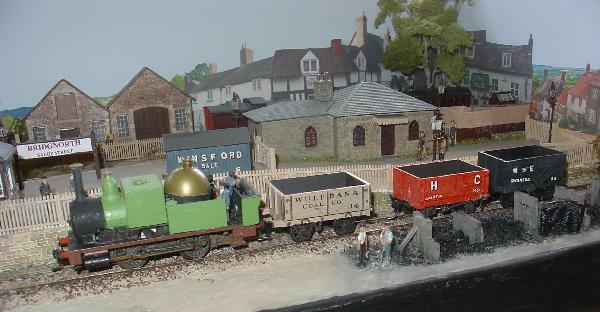 Technically the earliest of these locos were out-shopped in the mid-1860s, although they looked very different to the models as produced for the 20th century. If I can bring myself to do the surgery, the rear of the cab could be cut off and the loco used on Salop Street. With the cab restored temporarily (Blutack perhaps?) it could be used on Shellsea (hired in from the LSWR) or even on a branch shared by the GWR/SR one side, or the other, of Nationalisation. Because the periods are so different, I don't see myself altering the boiler fittings, although I used the exact chimney and dome on MSR no. 1. Had a little time for thought about the Beattie tank. Think I'll try and see if spare body shells are available. If so, I'd almost certainly go ahead with backdating one for use on Salop Street. The other would need a repaint to Southern livery so it could be paired with a Pannier I have in storage, along with a collection of 1930s goods wagons. A previously unknown twig off the Bodmin & Wadebridge might then emerge, some time in the future. No luck yet with sourcing spare Beattie bodies, and I suspect they're unobtainable as spare parts. Meanwhile thoughts about a possible "Wenford twig" layout have been progressing, and I'm looking to see if a multi-mode layout with blocks of switchable scenery would be practicable. 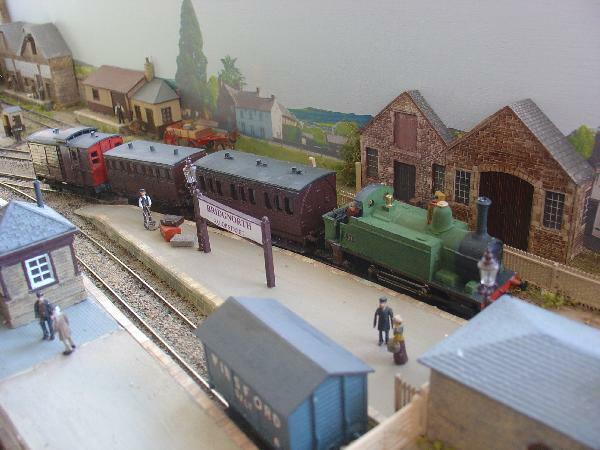 I could then run my GWR/SR 1930s stock and the rolling stock ex-Lazy River, and only have to build one baseboard. If this idea comes together I'll start its own thread but, with care, it does seem possible. 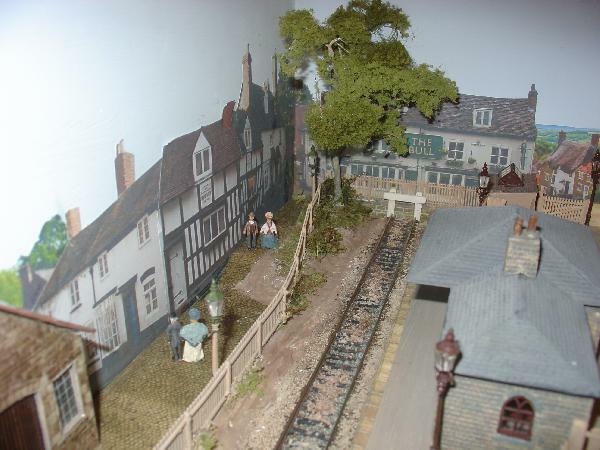 With the approach of September, the time is moving around when I will have to start concentrating on Salop Street again; the layout is due at the Croydon MRS show in October. 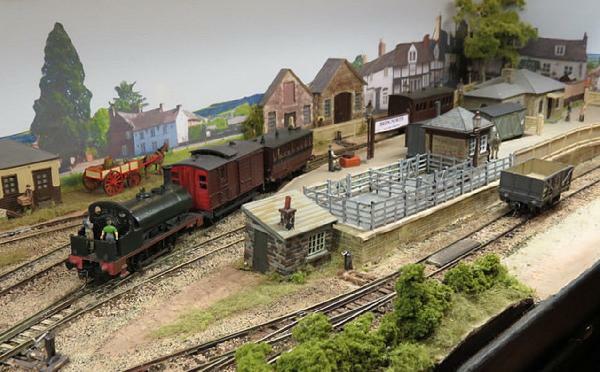 Meanwhile, here's a picture taken at the layout's last outing (photo by Andrew Knights). Since then the nasty hole in the number 5's rear buffer-beam has been filled in, although, as with all the loco fleet, running numbers are conspicuously absent. The outstanding jobs include a general review of coupler heights and springs, and some cosmetic work on a couple of wagons. 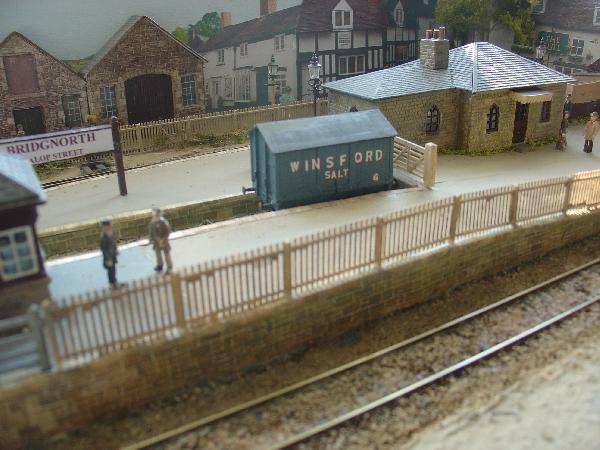 At a show some time ago I purchased a Hornby flat-wagon-plus-car combo. The car will be sold, but the wagon is just right for a Victorian-era carriage wagon; the one made earlier is far too long, and this one works out at around 15ft in length. 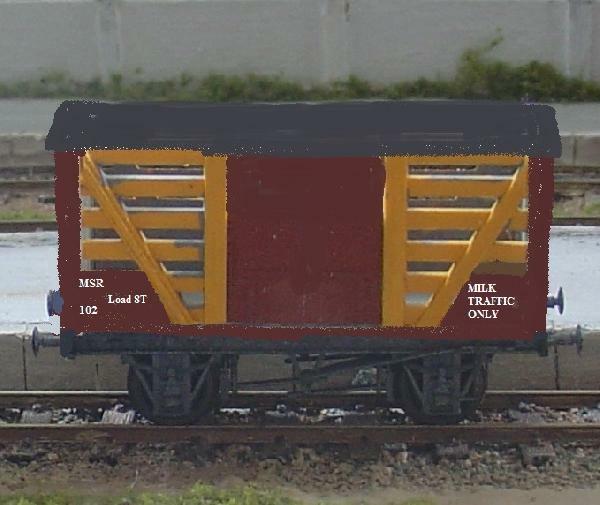 I've subsequently realised it's a GWR shunter's truck, minus the step-board chassis and large tool-box. As usual with Hornby offerings the solebars will need cutting away and cosmetic ones added to improve its "leggy" appearance. 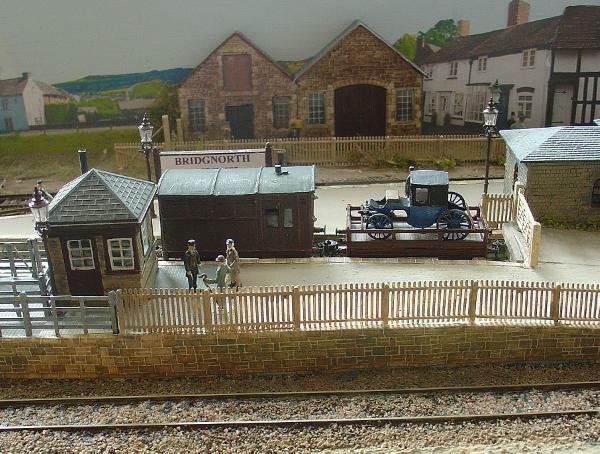 I have a white metal carriage kit for the load, which will add some useful weight, while the horses and coachman can be found employment elsewhere. 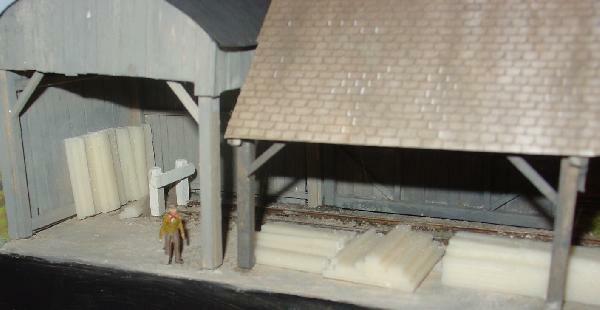 A second kit for a tumbril-style cart can be used in the coal yard. Having managed to get through nearly half the pre-show To Do List yesterday, thoughts turned to what to do with the redundant long carriage truck, now its replacement is ready to use. One idea is a short, semi-open van, to replace the larger milk van currently on loan from Shellsea. There were a few bits left over which were almost used for a cattle wagon for Great Sutton, but were abandoned as the design looked too short, and wrong. I have a nasty feeling I may have thrown the bits away but, if not, they might make a short milk van - like this. A liitle extra length and a filled-in doorway seems to make for a more likely design. Edit: the bits were still in the "bits box", so that's another project to go on the list, along with a short open wagon to be another Welsh colliery wagon - possibly hauling steam coal to the coaling stage at Salop Street. A good week-end, so far. Some work has been done on the carraige truck and its attendant horse carriage, and a start has been made on a water tank to supply the water carne at Salop Street. This has been something of a Goldilocks project - one tank too large, another too small. Finally managed to get one that turned out just right at the Burgess Hill show. It just needed a timber support, now completed; paintwork to finish - maybe tomorrow. If so, pictures then. 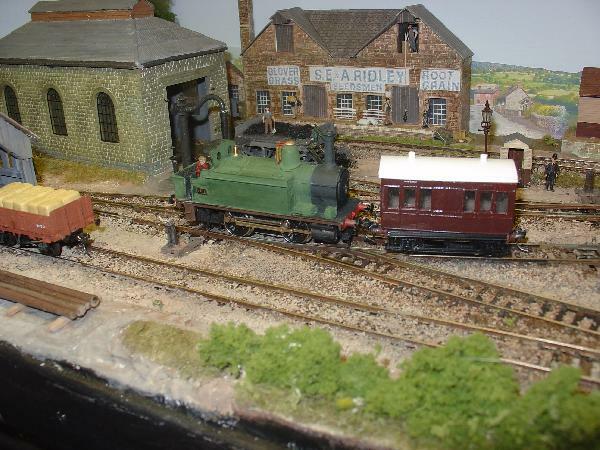 Meanwhile, the two ex-Bulstrode boats on Shellsea have been given rather more correct rigging than that seen before. Catch-up time for photos this morning, starting with Motorail - 1860 style. A shepherd has joined the group by the goods office temporarily. I will add some sheep and a dog to see how it looks before sticking them down. 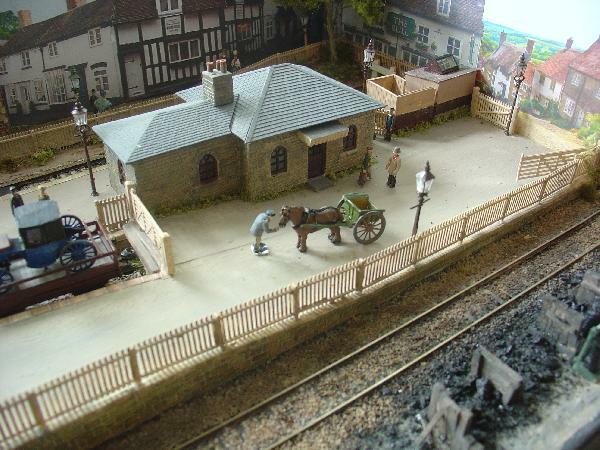 The other new horse-drawn vehicle is a farm cart, posed here in the station yard, but still looking for a permanent home. The kit came with a seated driver, who will be given the heavy four-wheeled cart by the goods shed to drive - once he's painted. I found a postman, who is to be given a change of clothing, as the driver for the smaller cart. He seems to be in deep discussion with his horse. The sheep do not register where I thought to use them - the paling fence masks them almost completely. I've tried them at the entrance to the station yard, where they look better - but it needs more than the two animals I seem to have in stock (sure there are more somewhere). Meanwhile, some thoughts on modelling this period have appeared in RM, just out. Part 2, with the old layout, coming next month I believe.